We LOVE our client Julie’s mission. She is a lifestyle mentor with a passion for helping women show up well in their lives everyday through sustainable health and fitness. So we were really excited to create a website for her that showcased how she empowers others, one that felt inspiring and fun! 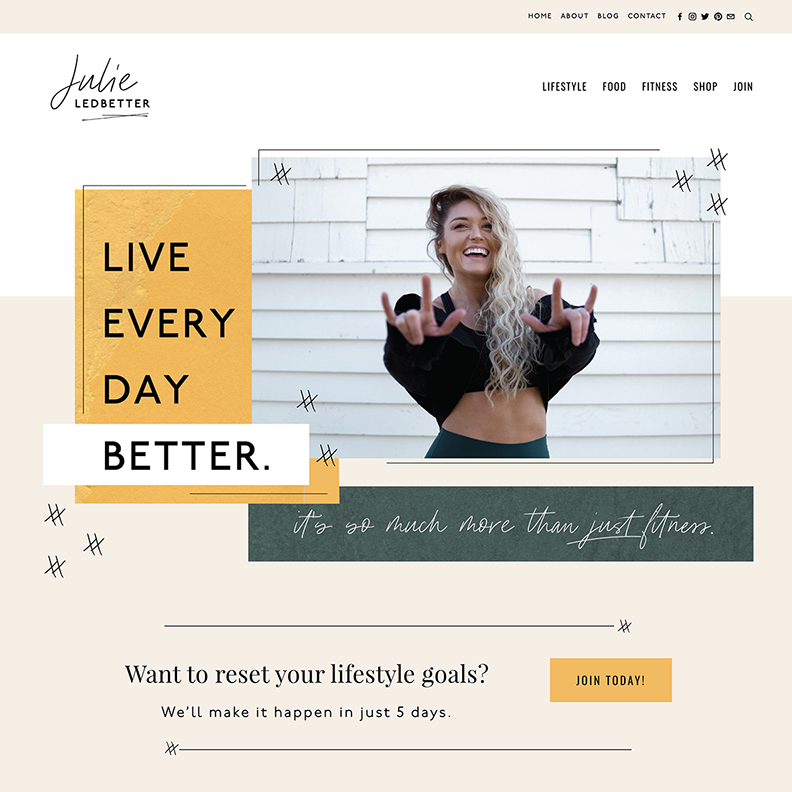 Julie’s site is a Restyle of our fresh and funky Poppy Template. We focused on creating a site that reflected her sense of style, and clearly showed off her services and resources. And how fun are those little graphics throughout?! Check out our Q&A with Julie below! Julie: It started back in 2012 right after I graduated college & met my boyfriend (now husband). Before I met him, I used to struggle a lot when it came to how I saw myself. More than anything, I wanted to be skinny. I remember constantly doing cardio (though it never lit me up inside) and secretly admiring the women in the weight room. They seemed so bold and fierce. When I met my husband Joshua, he’d been in the fitness industry for the last 10 years. He was the one who got me into the weight room and taught me how to lift. I started to fall in love with the confidence I was gaining from building my body to be physically and mentally strong. I went from hating my life during those hours (read as: countless life-sucking hourssssss) of cardio to being fueled by the knowledge that comes from empowering yourself from the inside out! Julie: Remain patient and trust that everything that is happening to you is actually happening "for" you! So many times, I have looked back at our past failures and have been so grateful to have gone through them because they have shaped us into the people we are today. Julie: Lol. This is hilarious because I remember when Joshua first asked me to quit my job and pursue this full time, I straight up told him "no" and I would "never do that." At the time, I had just opened up and was managing the second location of a thriving salon in my college hometown. I thought I was going to be working in the salon for the rest of my life. Fast forward 14 months post graduation (circa 2013) and we were already running a side hustle of selling headbands to my followers on Instagram, when Joshua had finally convinced me to quit my job and pursue the oh-so-wonderful, but terrifying, path of entrepreneurship and have been doing it ever since! Julie: Following my heart, and jumping into this crazy world of owning a business has molded me into the person I am today. Not only has it allowed me to get my time back, but I have gained more confidence, assurance, independence, creativity, and it allows me to truly live fulfilled every single day. The fact that I get to help other women SHOW UP to their life in a healthier version of themselves is honestly a dream come true, and I praise God everyday for the work that we do! Julie: I just want to acknowledge every single gal that I've worked with over the last couple months. You all have been so fun to work with, and this Restyle has been nothing short of amazing. You gals are truly the best and so gifted! I appreciate every single one of you. Thank you all for sharing your gift to this world! Follow Julie Ledbetter on Instagram for some inspiration!